One of my favorite keyboardists passed away suddenly in his sleep last month, the incredible T. Lavitz. I first saw Lavitz many years ago with the famed Dixie Dregs, and later as a founding member of the Grateful Dead-inspired "Jazz is Dead", alongside Alphonso Johnson, Billy Cobham and Jimmy Herring. Lavitz's death at a young age comes as shock to the jazz-rock world. Lavitz began his intensive study of classical and jazz piano at age seven. At the same time, the Beatles invaded America, igniting in Lavitz a lifelong love of rock music. Born on April 16, 1956, Lavitz grew up in New Jersey. He started taking piano lessons at the age of seven and was offered a scholarship at the Interlochen Arts Academy in Michigan where he studied before attending the University of Miami's School of Music. By twenty-two, Lavitz was asked to join the "rock, jazz, and everything else" instrumental band, the Dixie Dregs. It was a dream come true, because they were one of his favorite bands, even at that relatively early stage in their career. 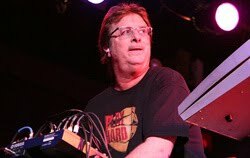 This first taste of fame happened during the last few days of 1978, lasting until the band split in 1983, by which time Lavitz had been voted "Best New Talent" in Keyboard Magazine's readers poll and the band had garnered four Grammy nominations. Since then, Lavitz has released eight albums as a leader, consisting mostly of his own compositions. Additionally, Lavitz produced the cult favorite, "Players," which features stellar performances by Jeff Berlin, Steve Smith, and Scott Henderson. Some of the artists featured on Lavitz's other albums include fellow "Dregs" Steve Morse, Jerry Goodman, Rod Morgenstein, Dave LaRue and Mark O'Connor, as well as college alumni Danny Gottlieb and Bruce Hornsby. Other contributions have also been made by Alex Ligertwood, Maria Muldaur, Jeff Richman, Michael McDonald, Paul Barrere, Catfish Hodge, Oteil Burbidge, Dennis Chambers and many more. In addition to the Dixie Dregs, Lavitz performed around the world with Widespread Panic, Mothers Finest, Jefferson Starship, Billy Cobham, and Bill Bruford. As the list of critically acclaimed recordings grew, Lavitz had said some of his favorite sessions were done with Nils Lofgren, Pat Benatar, The Bluesbusters, Peter Himmelman and perhaps most fondly "...I'll always be a Dreg". On Valentine's weekend 1992, the Dixie Dregs did a live reunion album for the newly reformed Capricorn Records in Atlanta, Georgia. "Bring 'em Back Alive" and the subsequent "Full Circle" studio disc each garnered Grammy nominations (bringing the total to six), and earning Lavitz the coveted "Jazz Keyboardist of the Year" award in Keyboard Magazine's readers poll. Lavitz was also a founding member of Jazz is Dead, an instrumental exploration into the music of the Grateful Dead. Lavitz had been joined in this project by Rod Morgenstein, Billy Cobham, Jeff Sipe, Alphonso Johnson, guitarists Jimmy Herring and Jeff Pevar and most recently, bassist Dave Livolsi. The band now boasts three CD's, "Blue Light Rain," "Laughing Water" and "Great Sky River," all of which are available on Zebra/Warner Bros., and a new as yet untitled studio album. The last week of August 1999, the Dixie Dregs were reunited again for six shows, at which time a new album, "California Screamin'" was recorded at the Roxy in Hollywood, California. They had such a good time together that a commitment was made to hit the road for a new tour early in 2000, and each subsequent year as well. The latest "run" of Dregs dates took place in California, during the first week of Jaunary 2007. In 1991 Lavitz was invited to join Widespread Panic after playing keyboards on their first album for the revived Capricorn Records label. Lavitz toured with Widespread Panic from April of 1991 through the end of that year, but left the band as the Dixie Dregs reunited and re-signed with Capricorn Records in 1992. The re-formed Dixie Dregs shared a bill with Widespread Panic at two events in February 1992 with Lavitz performing with both bands; these were his final two appearances as the keyboardist for Widespread Panic. The Dixie Dregs recorded 'Bring 'Em Back Alive' during a tour in February. Violinist Allen Sloan, who had become an anesthesiologist, was unable to continue touring and was replaced by former Mahavishnu Orchestra violinist Jerry Goodman. That year Lavitz won the 'Jazz Keyboardist of the Year' category of Keyboard Magazine's Annual Readers Poll. 'Full Circle', the first Dregs studio album in 12 years, was released in 1994. Another solo album 'Gossip' was recorded before Lavitz joined Jefferson Starship in 1996. Jazz Is Dead was formed at the end of 1997 with Lavitz, Herring, Johnson and Cobham interpreting the Grateful Dead's music in a jazzy, instrumental vein. "Blue Light Rain" was recorded during the first tour in 1998. Cobham was replaced by Rod Morgenstein and Jeff Sipe by the time the second album 'Laughing Water' was released. In the first part of the new millennium Lavitz took part in several projects. 'Endangered Species', with Herring, Richie Hayward and Kenny Gradney was released in 2001, 'Cosmic Farm', with Rob Wasserman, Craig Erickson and Sipe, was released in 2005 and 'Boston T Party', with Dennis Chambers, Jeff Berlin and Dave Fiuczynski, was released in 2006. In the summer of 2006 he began teaching at the Summer Performance Program at the Berklee College of Music, Boston, MA. Back in the studio at the start of 2007, the music for "School of the Arts" was composed. "This is some of my best stuff in a looong time" Lavitz says. Released in October of 2007, this is his first for Magnatude (Magna Carta) Records, and boasts an allstar cast which consists of Dave Weckl, John Patitucci, Frank Gambale, Steve Morse and Jerry Goodman. Regarding this lineup, the response from Lavitz is "...honored to have my music played by guys like this!" We're going to miss you T.